These were, and still may be, my kids’ favorite homemade snack, even though they are quite grown up now! A combination of nut butter, chocolate, raisins, and hempseed or wheat germ adds up to a high-protein snack for kids, teens, and adults alike. Photos by Evan Atlas. Combine all the ingredients except the sesame seeds in a food processor. Process until the mixture is completely smooth. You may have to stop the machine and reach in with a spoon a couple of times to break up clumps. 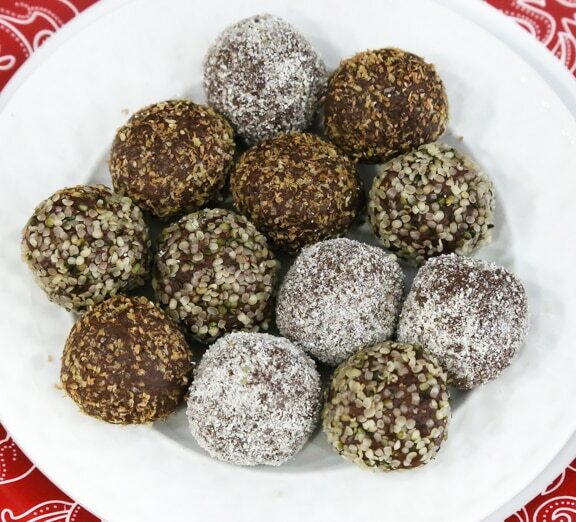 Roll into a dozen 1-inch balls; roll them in sesame seeds if you’d like. 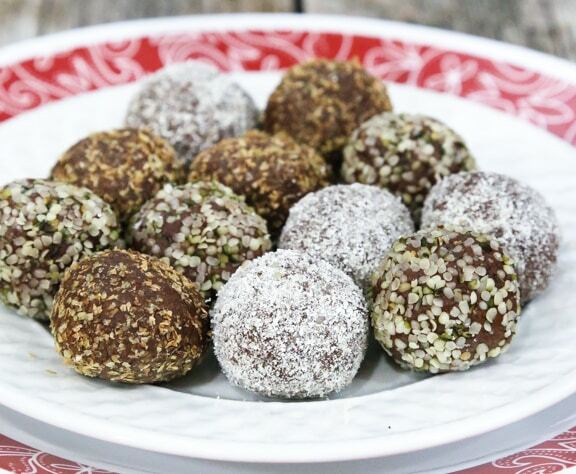 Refrigerate for about an hour, or until the “truffles” are firmed up. Keep any not devoured at once refrigerated and covered. Make sure to explore the entire Veg Kids and Teens page on VegKitchen for lots of easy, healthy recipes for vegetarian and vegan kids and teens. 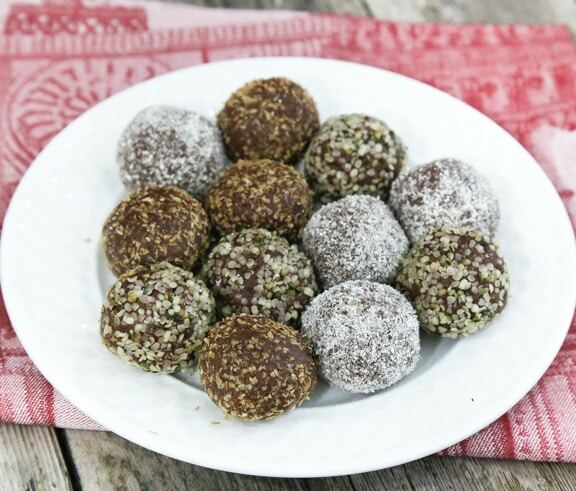 Explore more of VegKitchen’s No-Bake and Raw Sweets. This looks amazing. Thank you so much for posting. For more tips and recipes check out http://www.chooseveg.com/vegan-recipes.asp! Thank you so much for posting this recipe. For more information check out ChooseVeg.com for more tips and recipes! Sharon, your tweaks sound so healthy and delicious, thanks for sharing! These look GREAT!! I am currently out of hemp seeds and wheat germ. Could anything else be substituted? Hi Laura — this needs something dry and powder; the only other thing that comes to mind might be milled chia seeds. These impart a bit more of an assertive flavor and texture, though. So I’d suggest waiting until you restock your hemp or wheat germ! WOW! These are truly wonderful! Even my skeptic husband loved them. I was shocked at how the texture and flavour of these truffles resembled the traditional version. I used Hemp instead of wheat germ and they were perfect. Plus, the sesame seeds added a perfect flavour and texture. Thank you so much for sharing this super yummy treat. Amanda, sorry for the delayed response. I also use hemp seeds now instead of wheat germ. Glad you and your hubby enjoyed this! I don’t have a food processor. Can these be made in a blender? Pandora, I’m just not sure how it would work. The mixture is very thick and I’m afraid it wouldn’t process evenly or get stuck on the bottom. If you want to take a chance and give it a try, let me know if it works!